In 1701 Tsar Peter the Great decreed that all residents of Moscow must abandon their traditional dress and wear European fashion. Those who produced or sold Russian clothing would face "dreadful punishment." Peter's dress decree, part of his drive to make Russia more like Western Europe, had a profound impact on the history of Imperial Russia. This engrossing book explores the impact of Westernization on Russia in the 18th and 19th centuries and presents a wealth of photographs of ordinary Russians in all their finery. 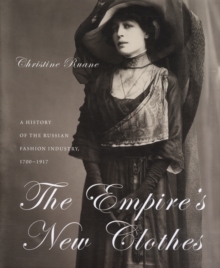 Christine Ruane draws on memoirs, mail-order catalogues, fashion magazines, and other period sources to demonstrate that Russia's adoption of Western fashion had symbolic, economic, and social ramifications and was inseparably linked to the development of capitalism, industrial production, and new forms of communication. This book shows how the fashion industry became a forum through which Russians debated and formulated a new national identity. Pages: 276 pages, 70 b-w + 50 color illus.